Aly Raisman is already a two-time Olympian with 6 medals from the 2012 London and 2016 Olympics, including gold medals in the team competition, while serving as captain. She is also the latest gymnast to step forward with allegations of sexual abuse against USA Gymnastics and their team doctor, Larry Nasser. Thanks in part to the powerful coverage of the Indianapolis Star, and also in part to the recent wave of “#MeToo” revelations against men in power who prey on women, dozens of young women have come out publicly about Nasser, who has been arrested and been slapped with lawsuits. Raisman: I was in denial. I was like, “I don’t thi– I d– I don’t even know what to think.” It– you don’t wanna let yourself believe but, you know, I am– I am– I am a victim of– of sexual abuse. Like, it’s really not an easy thing to let yourself believe that. Raisman: I was just really innocent. I didn’t really know. You know, you don’t think that of someone. You know, so I just– I trusted him. LaPook: You thought it was medical treatment. Raisman: I didn’t know anything differently. We were told he is the best doctor. He’s the United States Olympic doctor and the USA Gymnastics doctor, and we were very lucky we were able to see him. LaPook: So it was only after the investigator left that you began to put the pieces together. Raisman: Yeah. I mean, I think it’s important for people to know too I’m still trying to put the pieces together today. You know it impacts you for the rest of your life. Raisman: Why are we looking at why didn’t the girls speak up? Why not look at what about the culture? What did USA Gymnastics do, and Larry Nassar do, to manipulate these girls so much that they are so afraid to speak up? Raisman: I am angry. I’m really upset because it’s been– I care a lot, you know, when I see these young girls that come up to me, and they ask for pictures or autographs, whatever it is, I just– I can’t– every time I look at them, every time I see them smiling, I just think– I just want to create change so that they never, ever have to go through this. Raisman (explaining the predatory practice of “grooming”): He would always bring me, you know, desserts or gifts. He would buy me little things. So I really thought he was a nice person. I really thought he was looking out for me. That’s why I want to do this interview. That’s why I wanna talk about it. I want people to know just because someone is nice to you and just because everyone is saying they’re the best person, it does not make it okay for them to ever make you uncomfortable. Ever. LaPook: If you could hit the rewind button, is there anything you would have done differently? Lynn Raisman: I think the most important thing, if anyone takes anything away from this interview is sit down with your kids and explain to them that predators aren’t just strangers. They can be highly educated. They can be very well-respected in the community. It could be a family member, it could be a family friend. So, you know, that’s really, the, I mean, if I could go back in time, I would do that. As 60 Minutes explains, USA Gymnastics has always had a policy that an adult should “avoid being alone with a minor.” Clearly that policy was not publicized or enforced. But as far as Raisman is concerned, it’s time to publicize and enforce. Raisman: Nobody ever educated me on, “Make sure you’re not alone with an adult.” You know, “Make sure he’s not making you uncomfortable.” I didn’t know the signs. I didn’t know what sexual abuse really was. And I think that needs to be communicated to all of these athletes, no matter the age. Watch the 60 Minutes’ interview here. Telstra’s “I Go to Rio” Ad: Legal or Illegal Example of Ambush Marketing? To the average viewer in Australia, it’s just another ad during the Olympic season. With a sponsor spending millions for a long-term relationship with the AOC and the Olympic brand, the AOC has an obligation to protect against so-called ambush marketing, ads or campaigns that associate with the Olympics even though they did not pay for the rights to do so. The AOC viewed this advertisement as a prime example of ambush marketing, and filed a lawsuit against Telstra when they started broadcasting the commercial just prior to the start of the 2016 Rio Olympics. Part of the issue was the statement made by the voiceover on the commercial: “This August, for the first time ever, you can watch every event in Rio live with the Olympics on Seven app and Telstra on Australia’s fastest mobile network.” In essence, the AOC saw this as piggybacking off of another official sponsor, Seven West Media, which is the network with rights to broadcast the Olympics. Additionally, the advertisement ended with the text, “Official Technology Partner of Seven’s Olympic Games Coverage.” According to this article in the Sydney Morning Herald, the lawyer representing the AOC explained that Telstra modified that statement and even added a disclaimer that it was not an official sponsor of the Olympic Games, which I presume means that the AOC is arguing Telstra was aware that the audience might be confused regarding their relationship to the Olympics. “The primary judge found that this reference does not make the advertisement misleading or deceptive as contended by the AOC. We find no error in that conclusion. The Full Court also upheld Justice Wigney’s finding that a “reasonable person viewing the advertisements would not necessarily know about or recollect Telstra’s previous sponsorship of the Australian Olympic team, let alone turn his or her mind to that fact when viewing the commercial”. “As to Seven’s advertisements, he (Justice Wigney) found that they simply confirm that Telstra’s sponsorship arrangement is with Seven. Those findings of fact were open to the primary judge,” Full Court judges Andrew Greenwood, John Nicholas and Stephen Burley found. What is a multimillion-dollar sponsorship worth if your key competitor can muscle in on your exclusive rights? Not much according to a recent decision by the Full Court of the Federal Court. There is scary cute. And there is scary scary. On this 31st day of October, aka Halloween, here are three legitimately scary moments in Olympic history. These images are not for the faint of heart. Samir Ait Said, gymnast for France, broke his leg in a vault qualifier at the 2016 Rio Olympics, the snap of the bone so loud that people in the stands could hear it. At the 1988 Seoul Olympics, diver Greg Louganis was performing a reverse somersault dive in the preliminaris of the 3-meter springboard competition when the back of his head slammed into the board full force. Despite the concussion and five stitches he received after that dive, he still went on to win the gold medal. He was a member of the Brazilian men’s volleyball team at the 1964 Tokyo Olympics. After serving as the head of the Brazilian Volleyball Confederation, he was selected as the president of the Brazilian Olympic Committee and a member of the International Olympic Committee (IOC). And in his role as head of the Rio de Janeiro Organizing Committee, he led the bid process that resulted in the selection of Rio de Janeiro for the XXXI Olympics in 2016. But today, Carlos Nuzman is a man under arrest on bribery and fraud charges. A French investigation into the activities of former IAAF head and IOC member, Lamine Diack, who is under detention in France, have uncovered evidence that indicates vote buying during the bid process for the 2016 Games. Following Nuzman’s arrest, the IOC suspended him from his honorary membership in the IOC, and has been released from duties in the IOC coordination commission overseeing preparations for the 2020 Tokyo Olympics, according to the Daily Mail. Not only has Nuzman been impacted, the IOC has suspended the Brazilian Olympic Committee, frozen that organization’s funds, and will not allow it to vote on Olympic matters. Airbnb helped find accommodations for 85,000 people during the 2016 Rio Olympics. That is, according to Fortune Magazine, 17% of the approximate 500,000 local and foreign tourists who visited Rio during the 2016 Rio Olympics. Handling spikes in tourist traffic during big-tent events like the Olympics, World Cup, or industry conventions is a challenge, even more so in cities like Tokyo that are already at high occupancy rates during normal weeks. Services like Airbnb have business model which connect travelers with individuals who commonly offer up their own apartments or houses and sometimes more personalized service, for fees often lower than the hotel chains. The Japanese government has been, contrary to trends in other countries and cities, rather welcoming to Airbnb, as this kind of service potentially opens up the less populated countryside of Japan to repeat travelers who want to see the “real” Japan. Through Airbnb hosts, travelers can stay in rice-field-side houses run by elderly folks whose children have long skipped town and are in need of additional spending cash. As the “Official Alternative Accommodation Services Supplier” of the 2016 Rio Olympics, Airbnb can argue that it put cash directly in the hands of Brazilian citizens, and helped the government and organizing committee deal with room over-capacity during the Olympics. According to this Fortune article, 421,000 arrivals stayed at Airbnb rooms in Brazil in 2015. In 2016, the year of the 2016 Olympics, the number of arrivals doubled to more than 1 million. Just got this in the mail from a friend – a 7-dollar note! When the rugby team from Fiji won their nation’s first gold medal in the Olympics’ first rugby seven’s final at the 2016 Rio Olympics last August, it seemed as if all 900 thousand citizens jumped up and rejoiced. The front of the bill is a striking vertical layout, featuring the team captain Osea Kolinisau with the ball, and the team coach, Ben Ryan, looking contemplative. The back of the bill shows the entire team. A watermark shows team member Svenaca Rawaca running with the ball as well. Unemployment in Brazil was 10%. Inflation was 10%. Brazil’s credit rating was junk status. The currency had devalued by a third at that point in December 2015. 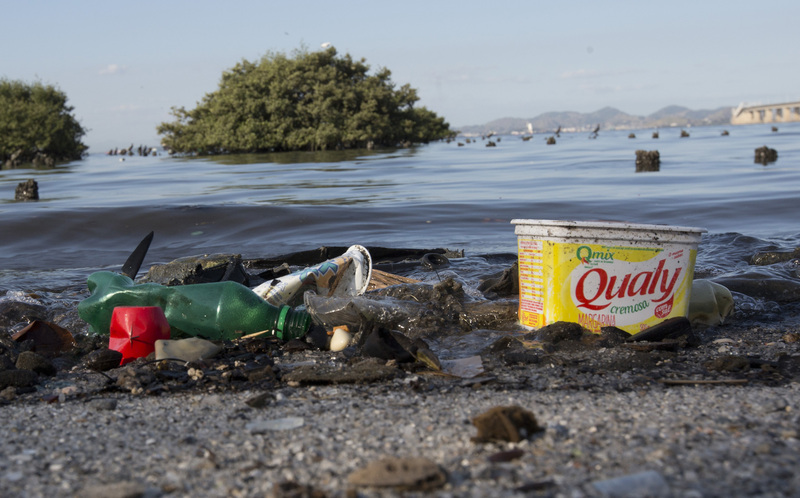 Guanabara Bay, where the boat competitions would take place, was getting horrific PR due to pictures displaying the filthiest waters you’d never want to wade through. The president of Brazil, Dilma Rouseff, was in the process of being deposed for corruption, as news of the biggest corruption investigation in Brazilian history was splashed across the news headlines on a daily basis. And I wrote all that even before the Zika Virus became a thing. A year later, not all that much has improved in Rio de Janeiro. As this good AP summary of Rio a year later states, you could say there was some good to come out of the Rio Olympics. The Olympics left behind a new subway line extension, high-speed bus service and an urban jewel: a renovated port area filled with food stands, musicians and safe street life in a city rife with crime. These probably would not have been built without the prestige of the Olympics. But the games also imposed deadlines and drove up the price. A state auditor’s report said the $3-billion subway was overbilled by 25 per cent. But generally, the bad according to that article outweighed the good. A $20-million golf course is struggling to find players and financing. A few dozen were on the course on a recent, sunny Saturday. The clubhouse is mostly unfurnished, and it costs non-Brazilians 560 reals ($180) for 18 holes and a cart. Some of the politicians behind the Olympics have been accused of graft, and organizers still owe creditors about $30 million to 40 million. Former President Luiz Inacio Lula da Silva, who wept when Rio was awarded the games, was convicted last month on corruption charges and faces a 9 1/2-year prison term. He is appealing. Former Rio de Janeiro Mayor Eduardo Paes , the local moving force behind the Olympics, is being investigated for allegedly accepting at least 15 million reals ($5 million) in payments to facilitate construction projects tied to the games. He denies wrongdoing. The Rio Olympic organizers are still struggling under the weight of an approximate USD40 million debt. When the organizers appealed to the IOC for relief, the IOC replied no, saying “it had already contributed a record $1.53 billion to the Rio Olympics. Of course, it’s not all bad news. At least Ryan Lochte, the American swimmer who lied about being robbed at gunpoint at a Rio gas station, was actually cleared last month of charges that he falsely communicated a crime to authorities.